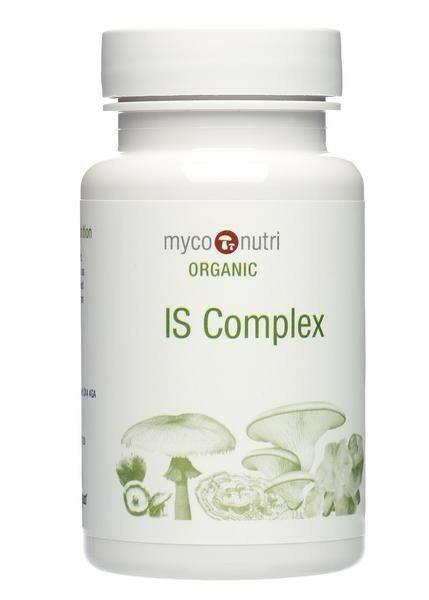 MycoNutri Organic IS Complex combines organic extracts from four mushrooms (Maitake, Reishi, Chaga and Shiitake) with high levels of beta-glucans, organic Ophiocordyceps sinensis (Cordyceps) mycelial biomass, organic Matcha Green Tea and vitamin-C rich organic Acerola. Vitamin C and green tea have both been shown to reinforce the benefits of mushroom beta-glucans while Cordyceps' nucleoside derivatives and triterpenoid compounds from Chaga (betulinic acid derivatives) and Reishi (ganoderic and lucidenic acids) contribute to the all-round support offered by this combination. MycoNutri products are manufactured in the U.K. to EC food standards. The mycelial biomass is grown in the USA on sterile grain-based substrate and is optimized to maximise substrate conversion and secondary metabolite production. Organically certified by The Soil Association.